Wine is often touted as having beneficial properties. However, there are some negative side effects associated with drinking alcohol, and not everyone should indulge in drinking these beverages. The following health risks have been associated with the consumption of alcoholic beverages, including wine, and it's important to be aware of them so you can make an informed decision about how much you want to drink. One of the most widely understood long-term effect of overindulging in alcoholic beverage is liver disease. One of the functions of the liver is to filter out impurities from the blood. When alcohol is drunk in large quantities, this organ has to work overtime. Eventually, after years of alcohol abuse, the liver may fail to work properly or simply quit functioning altogether. Some individuals who become alcoholics may suffer from cirrhosis of the liver, which can lead to death. According to the National Institutes of Health, liver disease was the twelfth leading cause of death by disease in the United States in 2007. While there is still discussion about whether it is safe to drink any alcohol during a pregnancy, such as one glass of wine periodically, doctors generally caution women to abstain from drinking alcohol for the duration of their pregnancy. Sulfites are found in many foods, including wine. They can be found in many dairy products, such as cheese and other foods like dried fruits, spices, jams and jellies. The sulfite content in white wine is usually higher than that found in red wines. No wine, even organic wine, can be found without containing some sulfites. 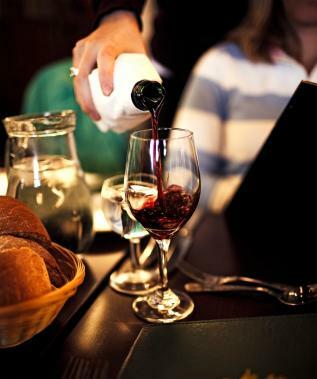 Individuals who are allergic to sulfites may suffer from hives, nausea and anaphylactic shock. The individuals affected by this allergy are most often asthmatics. Wine health risks may be increased when consuming the beverage while taking certain prescription drugs. Prescriptions now have warning labels so that individuals are aware of the risks before they mix their prescriptions with wine. Adverse reactions vary, depending upon the prescription taken and the amount of wine consumed. There is evidence that wine, particularly red wine, may trigger migraine headaches in some individuals. Tannins and phenolic flavonoids, both found in grape skins, may be the cause. Professor David Mills of UC Davis announced in his research in 2006 that modifying the fermentation process may reduce the risk of headaches caused by tannins and phenolic flavonoids. There is a potential for weight gain when drinking wine or any other alcoholic beverage. Alcohol contains empty calories and triglycerides, which contribute to increased LDL or "bad cholesterol" levels. According to studies by the National Cancer Institute, alcohol consumption is related to estrogen positive breast cancer in postmenopausal women. Drinking alcohol increases estrogen levels and raises the rate of tumor progression. There are health risks and benefits associated with drinking wie. Physicians are quick to point out, however, that if an individual doesn't drink now, he shouldn't begin drinking to reap any reported health benefits from wine. Resveratrol, which is found in red wine, can be purchased in pill form. Resveratrol has been found to be effective in destroying an enzyme that " that destroys dangerous estrogen metabolites," according to a study at the University of Nebraska. Research on the benefits of wine consumption will continue, especially since it is believed to have several curative properties. In the meantime, people should remember to drink responsibly in order to avoid any of the adverse effects associated with alcohol consumption.